Outrage around homeless mom charged for sending son to better school. Education activists are rallying around a homeless woman who may face jail time for enrolling her son in kindergarten under a friend’s address. Supporters say the woman’s story is yet another dismaying example of inequality in the U.S.education system. Tanya McDowell, a homeless single mother from Bridgeport, is charged with first-degree larceny and conspiracy to commit first-degree larceny for signing up her 5-year-old son to attend nearby Norwalk schools under the address of a friend. (Her son went to the school for four months. Her friend has been evicted from public housing for letting McDowell use her address.) McDowell may face up to 20 years in prison and a $15,000 fine if convicted. Gwen Samuel, aConnecticuteducation activist, is organizing a press conference to try to get the charges dropped and raise awareness about parents who are criminally prosecuted, rather than dealt with individually by the school district, for using false addresses. 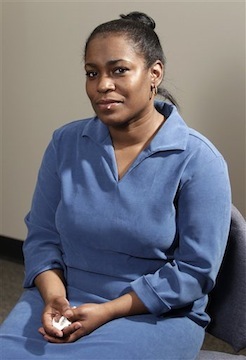 She says she expects a few hundred people to show up at Norwalksuperior court at 9 a.m. Wednesday, including Kelley Williams-Bolar (pictured), the Akron, Ohio-based mom who made national news in January, when she was jailed for using her father’s address to send her kids to a better-performing school. Bolar’s story ignited a debate about inequalities in the public education system, where poorer parents must send their kids to poorer schools because much of the funding is on the local level. “This will continue to happen–this will set a precedent and districts will be like, ‘OK I found a new way to get my money back, let’s go after them,'” Samuel tells The Lookout. Boyce Watkins, a Syracuse University professor and activist, tells The Lookout that Williams-Bolar heard about McDowell’s case and wanted to support her. “Kelley called me and said, ‘I can’t believe they’re doing this to her, how can I help? '” She’s now on her way toConnecticut, and her trip is paid for by Samuel’s newly founded non-profit Connecticut Parents Union. “First it happens to Kelley, then it happens to Tanya–they both happen to be poor black mothers trying to find a way to provide a better life for their children,” Watkins said. Samuel says McDowell “absolutely” sent her son to the Norwalkkindergarten because she knew it was better than the schools in nearby Bridgeport. “If you could see … where he is now compared to Brookside, you’d see why I chose Norwalk,” McDowell told the Daily Norwalk of her son’s new school,ThomasHookerElementary School inBridgeport. “There has to be a penalty for stealing our services,” school board president Jack Chiaramonte countered in The Daily Norwalk. McDowell, who used to work in food services, told the Stamford Advocate she occasionally stayed in a Norwalk homeless shelter–but she didn’t register there, which would have made her son eligible to attend the school. “I had no idea whatsoever that if you enroll your child in another school district, it becomes a crime,” the 33-year-old told the paper. Parents are rarely criminally prosecuted for using false addresses.